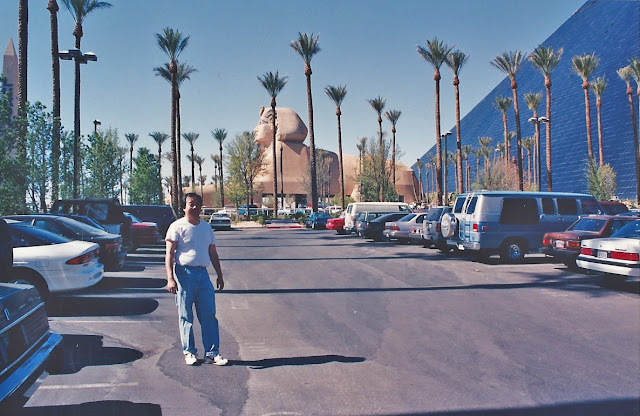 In July of 1994, Gil & I had planned to meet up with his brother, sister-in-law, and their baby daughter at the Luxor in Las Vegas for Independence Day weekend. On the way, we stopped at a gas station in the town of Baker off I-15 to gas up and get some refreshments. 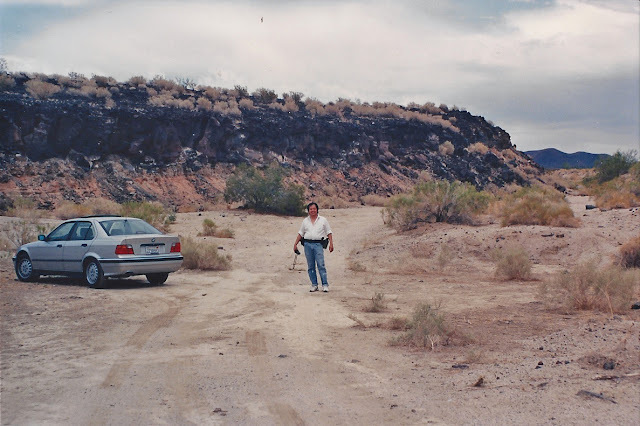 Before leaving, I was looking at the map and I noticed that there were some cinder cones only a few miles outside of town off of Kelbaker Road, and thought - hey, why not take a short detour and check it out before getting back on the road to Vegas? So, off we drove to the cinder cones. About 10-12 miles in, Gil pulled off the road at a spot which appeared to be the location of the lava beds and cinder cones (it was many years back, but I believe there may have been some kind of marker). There were no interpretive displays or exhibits around though, and since we didn't know exactly what the cinder cones were supposed to look like, we sort of assumed that some of the surrounding formations had to be them. So I took a bunch of pictures of every blip and hill in the area, to make sure I got one in. 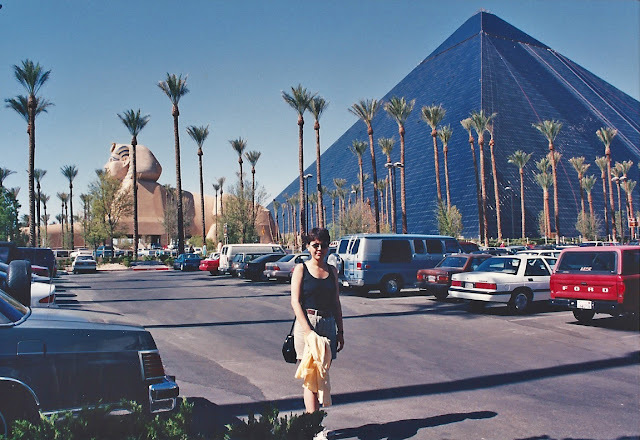 After a leisurely 20-30 minutes of checking out the area, we noticed it was getting towards high noon and the temperature was starting to climb towards triple digits, so we returned to the car, ready to continue on to Vegas. But when Gil tried to back the car up onto the road, nothing happened. I mean, the engine was running, the wheels were turning, but the car was simply not moving. This was not good. The more he tried to drive forward or backward, the worse it got, cuz we were apparently sitting in soft sand and the rear tires were just digging in deeper and deeper. I never really knew what those roadside "soft shoulder" signs meant until that moment. So, we got out of the car to survey the situation and assess our options. Being the eternal optimist (and a girl), I tried to make the best out of a seemingly dire predicament by being chatty and cheerful, trying to reassure myself and Gil that someone will come along soon and help us out. Gil was totally not amused, dead silent, and downright grim - what a trooper! 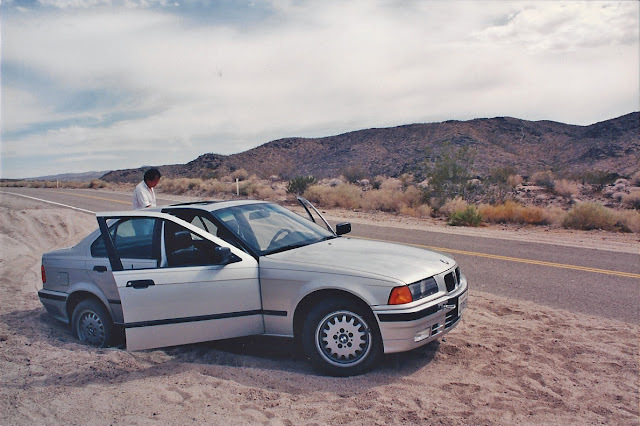 Not knowing what else to do and without any gear, we got down on hands and knees and starting scooping out the sand from around the tires with our bare hands. After what seemed like forever, we didn't make much progress so got back into the car to replenish on fluids (luckily I bought some water at the 7-11 before we left Baker) and to seek out some nominal shade. After being stuck out there for over 40 minutes at 115F in the shade and with no other vehicle in sight, I started to get that sinking, dire, heatstrokey feeling that we'd end up dying out there just a few miles away from civilization and a few feet off of a paved road - it's like getting killed by a durian fruit that falls on your head while you're trekking through an idyllic rain forest in SE Asia - not a proud moment you want emblazoned on your epitaph. Then, almost an hour into our nightmare, and out of the clear, blue, superheated sky, we saw an old camper rumbling down Kelbaker Rd. We ran out onto the road with sheer, unfettered joy to flag that sucker down. The camper had Idaho plates and the driver, an old timer (at least he looked like one to me, with his plaid shirt and grizzled look), got out to see what the problem was. 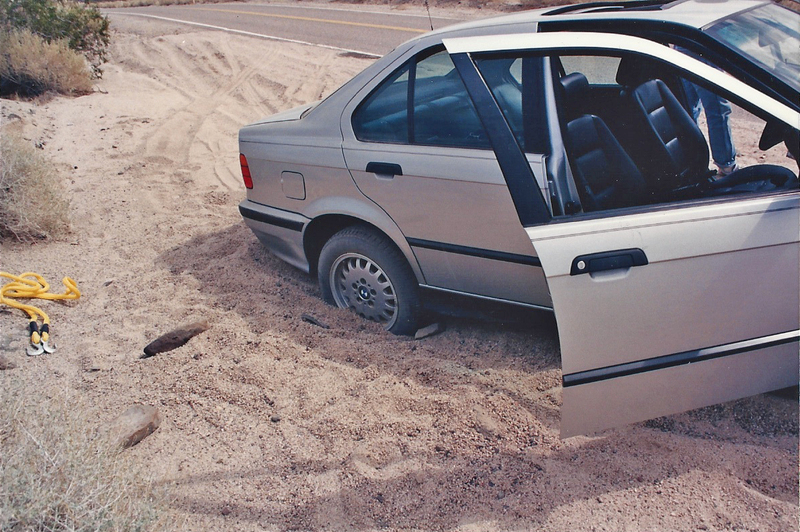 When he saw the bimmer stuck in the sand, his expression didn't change much except for that little glint in his eye, which all but chortled, 'those damned city slickers.' Anyhoo, Mr. Idaho was very kindly and used the hitch on his camper to pull us out in no time. So, at the end of the day, we made it to Vegas, despite walking into the Luxor completely dirty and bedraggled. At least the hotel clerk wasn't too suspicious or inquisitive and let us check in. In the intervening years, we've been back to the cinder cones and have hiked and camped in many locations throughout the East Mojave. I hope we've finally shed that City Slicker moniker. 7/1/96. 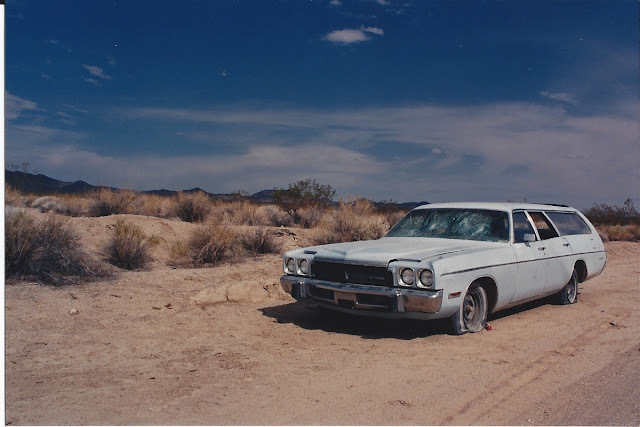 En route to the cinder cones, we saw this bullet-ridden old car off of Kelbaker Rd. 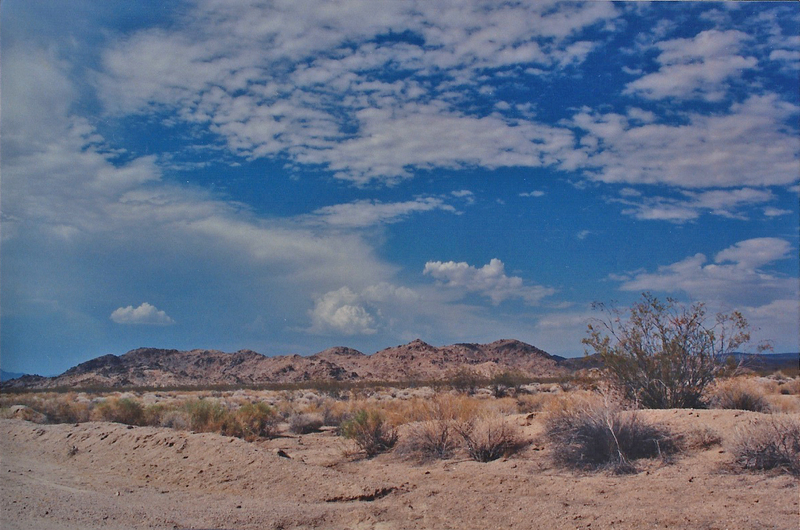 just past a sign for Devil's Playground (a 40-mile stretch of sand dunes and flats between Baker and the Providence Mountains). We should have taken this as an omen. 7/1/96. View from Kelbaker Rd. 7/1/96. 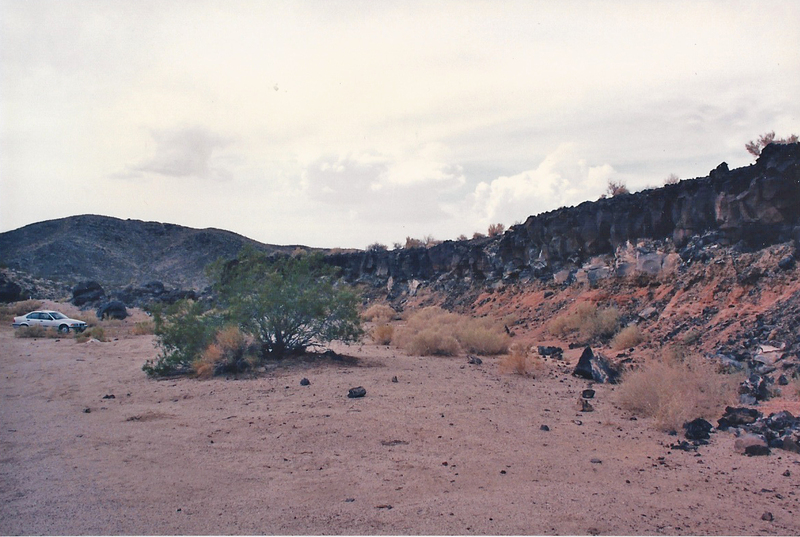 Lava beds near the cinder cones. 7/1/96. 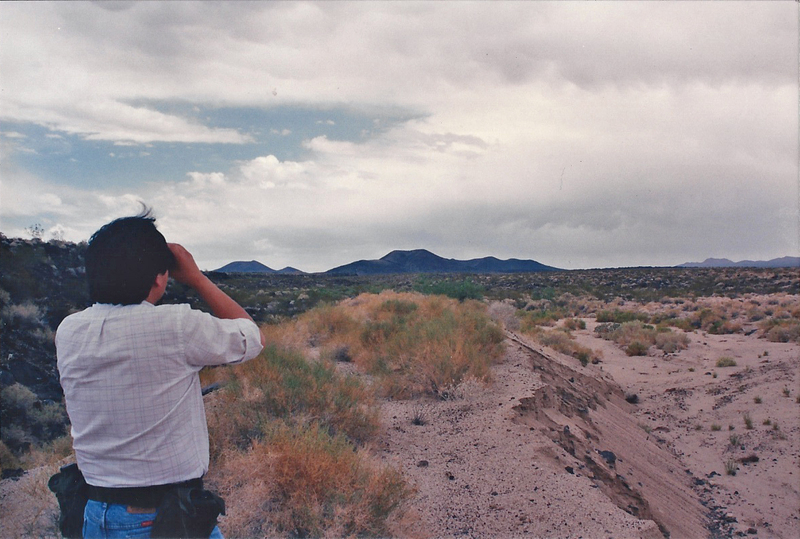 Gil , looking at what we think are the cinder cones in the distance. Roadside off Kelbaker Rd. 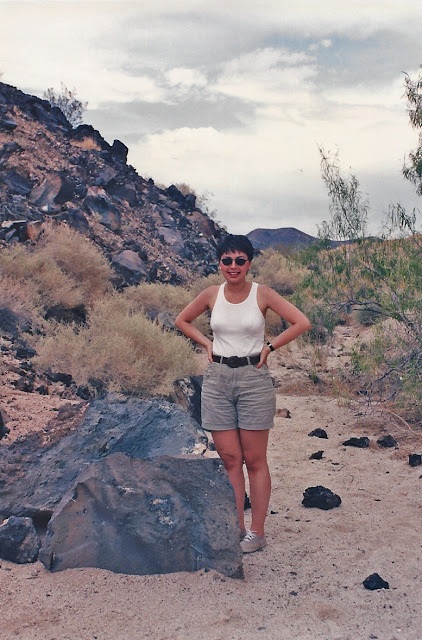 at the lava beds. 7/1/96. At the lava beds off Kelbaker Rd. 7/1/96. And then we got stuck in the soft sand. Gil was so not a happy camper until that camper from Idaho pulled us out. 7/3/96. In clean clothes a couple days later at the Luxor in Las Vegas. Directions: Take I-15 to Baker, and from Baker exit Kelbaker Rd, heading southeast. Follow GPS heading of N35 10' 0.86"/W115 49' 16.7" to dirt track that leads to the lava beds and cinder cones on the north/left side of Kelbaker Rd. Road Conditions: Kelbaker Rd. is a paved 2-lane road with soft shoulders in many areas (as we learned the hard way), so be careful parking off road. The road to the cinder cones is a dirt track, 4WD recommended. The Aiken Mine Road is an interesting side trip, if you're so inclined. 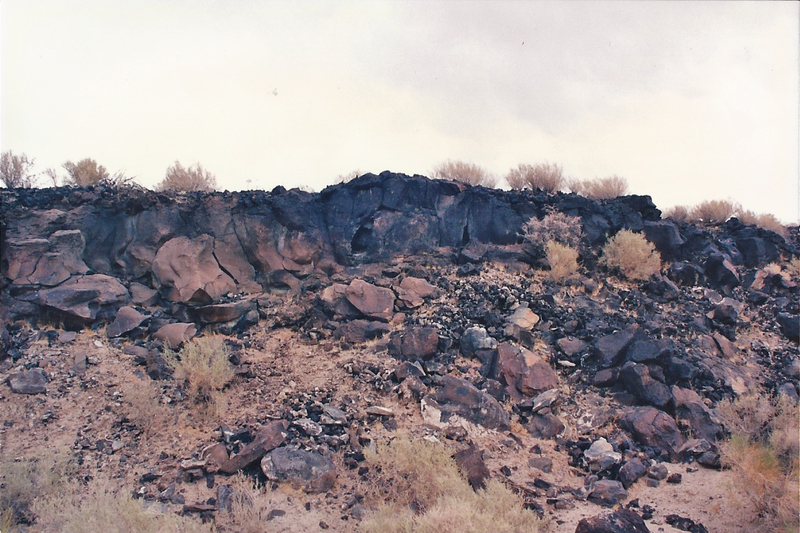 Since the 1960s, the Aiken mine has mined one of the cinder cones for tons of that reddish lava rock that so many people use in their gardens and landscapes. Fees: No entrance fee for the preserve. Hours: The reserve is open year-round. Visitor Center: Kelso Depot Visitor Center is 35 miles southeast of Baker off of Kelbaker Road. Open daily 9am - 5pm except for Christmas day. Exhibits, information, bookstore, restrooms, water, lunch counter (the 'Beanery'), picnic area. 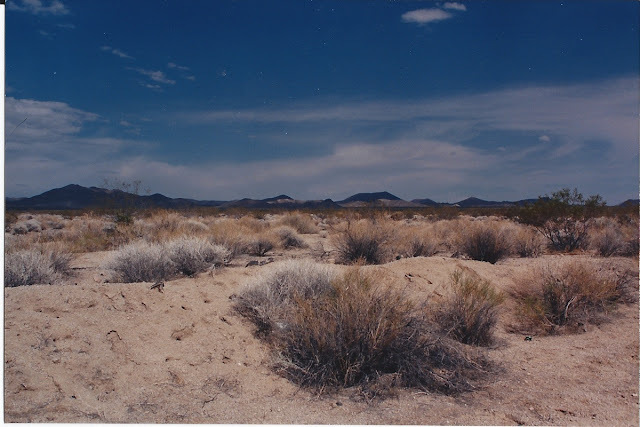 Camping: 2 primitive sites off road (no amenities or facilities, just a few rock-lined fire rings). 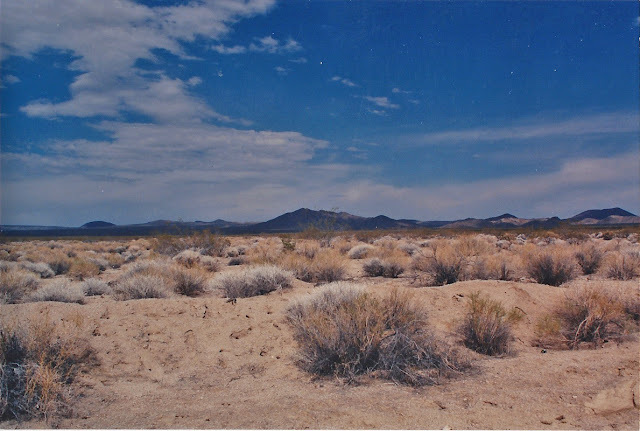 First one is 1/4 mile north of the dirt track to the cinder cones off Kelbaker Road, with several nice sites, private, beautiful vistas, abundant wildlife (birds, jackrabbits, etc.) 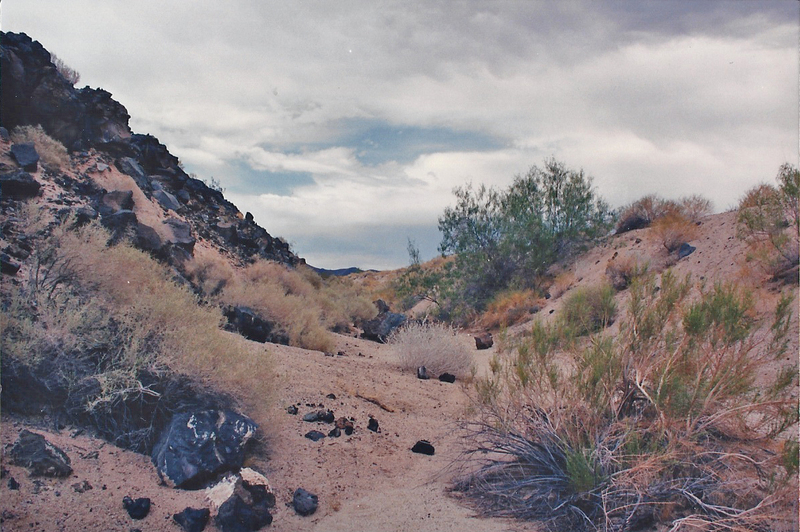 and wildflowers in the sandy wash below. You can hike to the cinder cones from this location. The second is located off Kelbaker Road at GPS: N35 12' 007"/w115 52' 20.3". Contact Info: HQ Barstow Information Center (760)252-6100. Kelso Depot Visitor Center (760)252-6108. Other: The cinder cones along Kelbaker Road are fairly young volcanic formations, dating back to near the end of the most recent ice age around 8,000 to 10,000 years ago. They comprise of 32 young volcanic cones which lie on top of a series of much older (10 million year-old) lava flows.